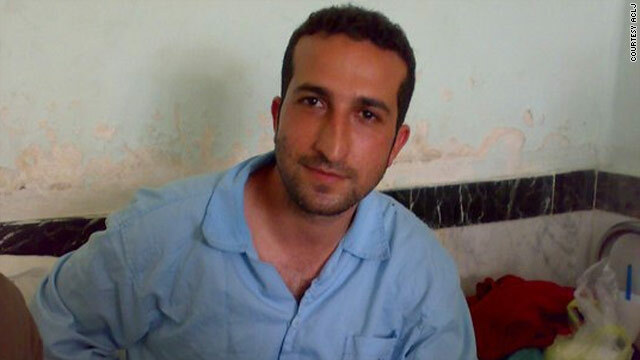 Pastor Youcef Nadarkhani shown in an Iranian prison. Washington (CNN) - The White House Thursday condemned the conviction of an Iranian pastor, who may be executed in Tehran for refusing to recant his religious beliefs and convert from Christianity to Islam. Pastor Youcef Nadarkhani "has done nothing more than maintain his devout faith, which is a universal right for people," a White House spokesman said in a statement. "That the Iranian authorities would try to force him to renounce that faith violates the religious values they claim to defend, crosses all bounds of decency and breaches Iran's own international obligations." The United States Commission on International Religious Freedom, an independent advisory group appointed by the president and Congress to monitor religious freedom around the world, Wednesday expressed "deep concern" for Nadarkhani, the head of a network of Christian house churches in Iran. After four days of an appeals trial for apostasy, Nadarkhani refused to recant his beliefs, the commission said. Chairman Leonard Leo said the pastor "is being asked to recant a faith he has always had. Once again, the Iranian regime has demonstrated that it practices hypocritical barbarian practices." While the trial is closed to the press, Leo said the commission collects information from sources in Iran and around the world. The commission's statement also called the trial a sham and said Iran is violating the International Covenant on Civil and Political Rights, to which it is a party. "A decision to impose the death penalty would further demonstrate the Iranian authorities' utter disregard for religious freedom, and highlight Iran's continuing violation of the universal rights of its citizens," the White House statement said. "We call upon the Iranian authorities to release Pastor Nadarkhani and demonstrate a commitment to basic, universal human rights, including freedom of religion." Nadarkhani was first sentenced to death in November 2010, the commission said, and in order to avoid the death penalty, he is being asked to recant his beliefs and convert to Islam. Leo said an apostasy trial is rare in Iran; the last occurred in 1990. Iran's claim stems from the pastor's Muslim parents. According to Leo, the court needed to verify if Nadarkhani had ever been a Muslim. In order to be given what Iran claims is the opportunity to recant his beliefs, Nadarkhani must have never been a Muslim before the age of 15, Leo said. Because he was given the opportunity during the four-day trial, it is apparent that the Iranian court found he was never a Muslim and therefore Nadarkhani could have converted. According to a source close to the situation within the Commission on International Religious Freedom, Ayatollah Ali Khamenei, the Supreme Leader of Iran, would have to sign off on the execution. Speaking on the condition of anonymity because of the subject's sensitivity, the source said such cases in Iran are difficult because of the lack of transparency in leaders' decision-making. The source also said that in the past, political prisoners have had their prison time and punishment reduced by the Iranian government. Though they did not say that was guaranteed in this situation, the source indicated it was a possibility. The American Center for Law and Justice, a right-leaning organization founded by television evangelist Pat Robertson, reported Wednesday night that Nadarkhani's death sentence had been overturned, meaning that the pastor would be receiving a lesser punishment. They sourced the claim to someone in Iran. Those reports could not be independently verified by CNN. The Permanent Mission of the Islamic Republic of Iran in the United Nations failed to comment on the ruling. Jordan Sekulow, executive director of the ACLJ, said the outcry from Christians in America has been loud and sustained. "American Christians, like never before, are engaged in this," Sekulow said. "This is evidence that Christians in America over the past decade have done a better job engaging in the persecution issue." Nowhere in the Quran has it said to kill people. It is not up to us to judge anyone. Available now on Amazon in Kindle and paperback formats. Religious persecution is alive and active in the world today. Pastor Youcef is not the only one. There is a woman in Pakistan who has been arrested for blasphemy and condemned to death. You can find out more about her story at http://www.callformercy.com. Many men and women around the world are persecuted and killed for their Christian beliefs. It is time for us to open our eyes. I appreciate the fact that CNN posted this story. Perhaps they could post one about Asia Bibi as well. Dear issue, this is not a death penalty issue. What is this mans crime? This is not a debate on the death penalty . This man is not a criminal. This is the teachings of Islam. Islam is a faith that it is ok to kill your brother. I am a Christian and Jesus told us to love our brother. Our brother of is not just the people who Like us but all men. I do not hate our Moslem brothers. I love them the same. I hate what they do but not them. Remember they are deceived . I pray they will see the error of their wayes. This is the core underlying reason why we should not have the death penalty in the US. Now we have little to no credibilty to take the high moral ground when, trying to stop these things from happening. Think about it. Wonderful, peace-loving religion that Islam, ain't it? When will the freakin' world wake up? Interesting how one christian brother is paying the ultimate price for his faith in Jesus Christ. Whilst the ad (body building worship) on the right, is promoting entertainment within the church, This is a form of godlyness, but the power of it, is renounced. Western christians are busy entertaining each other to gain members and wordly wealth as self indulgions. Once you point out the true christian religion, christians make anti-true Jesus Christ remarks, which is unscriptural. They need to protect their luxurious life. As an African who sees the reality of everyday life, poverty and political dictatorship, it is not much different from our brother in Iran who pays the price of Islam dictatorship. Even here in South Afica, pastors and believers are burnt and thrown out of trains because of religion, buy so-called christians. This doesn't make the news headlines, sorry. Western christianity need to understand, that their is a world wide active persecution, because of their religion and not because of crime. WAKE-UP CHRISTIANS, WE NEED TO PRAY MORE THAN EVER BEFORE! Pastor Nadarkhani is fighting a good fight. With Lord on your side, His name would be glorified. Both Christians and Muslims are screwed up in the head with their ancient game of telephone. Your post shows what a wonderfully well rounded person you are too. What if US sentences all imams to death here in the States? This might stop those muslims. Iran is a bunch of murderers. Why is President Obama silent on this? Are you racist? Troy Davis was innocent or at least there was so much doubt he should not have been murdered. Who cares what color he was. Troy Davis was a criminal. The man in this story did not commit any crimes. His only crime is that he gave his life to Lord Jesus Christ, because in Him he has seen a treasure surpassing any treasure this fallen world can boast of, and any man-made religion offers. THAT was his only crime. Troy Davis was found guilty. He murdered another human being. He deserved punishment in this world. In the same time God offered him forgiveness, yet did not relieve him of penalty of his crime. It does not mater what color he was, and you people need to stop parroting "racism" every time something happens and one of the colored people gets caught at something that gets him/her in trouble. God sees no color. He only sees two kind of people: His sons and daughters, adopted by Him through repentance and applying the shed blood of His Son, and those who are NOT His. If troy Davis came to know Him, and he were innocent of crime he was convicted of, he is blessed and justified, forever in peace with our Lord, rejoicing in His presence..... If he committed the crime, and in the same time claimed innocence by playing victim, using his race as a scapegoat, hoping to be set free, and yet put his faith in Christ... his sin could not be forgiven, becaue he did not confess it and acknowledge it publicly. There are sins that are private, only between God and us, but there are those that demand public confession in order to get forgiveness. I don't know this man's situation, nor much about his life in prison. But the things I posted here are so you will understand how things work from God's point of view. Maybe it doesn't mater to you, but one thing does mater, and should never be compared: life of a man who is persecuted for his faith in his Lord and Savior, and one who was found guilty of murder, shedding the blood of innocent person. That's the bottom line!! !